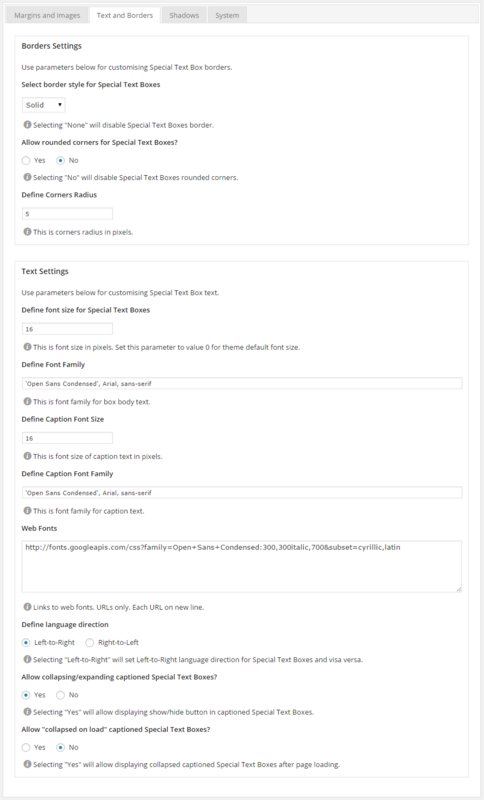 On the Settings page are accessible settings that apply to all STB blocks of text, regardless of the selected style. You can set border style, text shadow, box shadow etc. for your special text boxes. Define Show/Hide Tool Image – These images are displayed in the text block caption and shows the status of the visible/hidden text block. Also these images are show/hide buttons of text blocks in spoiler mode. Select image using media library or insert link to image. Define Duration of Collapsing/Expanding Animation – This is time of collapsing/expanding of the text block in milliseconds. Default value: 500 ms. Allow Big Image for Simple (non-captioned) Special Text Boxes? 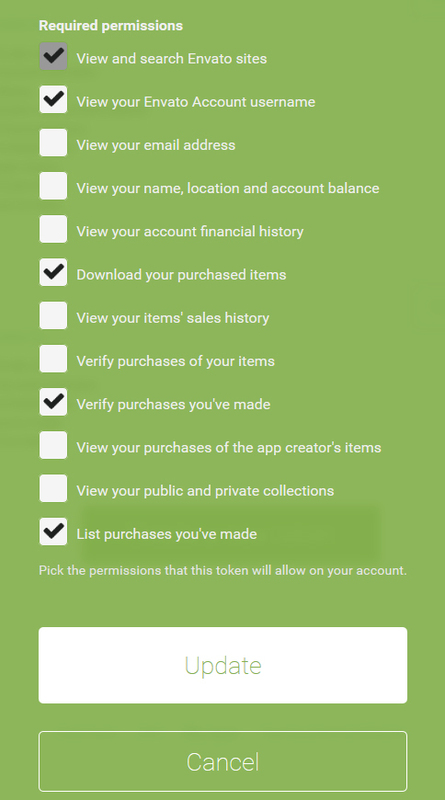 – Selecting “Yes” will allow big icons for Special Text Boxes in Simple mode. Allow icon images for Special Text Boxes? – Selecting “Yes” will allow displaying icon images in Special Text Boxes. Allow caption background colors for side image background (boxes without caption only) – for example: for Retro Theme – this value is false, for built-in Dark Theme – true. 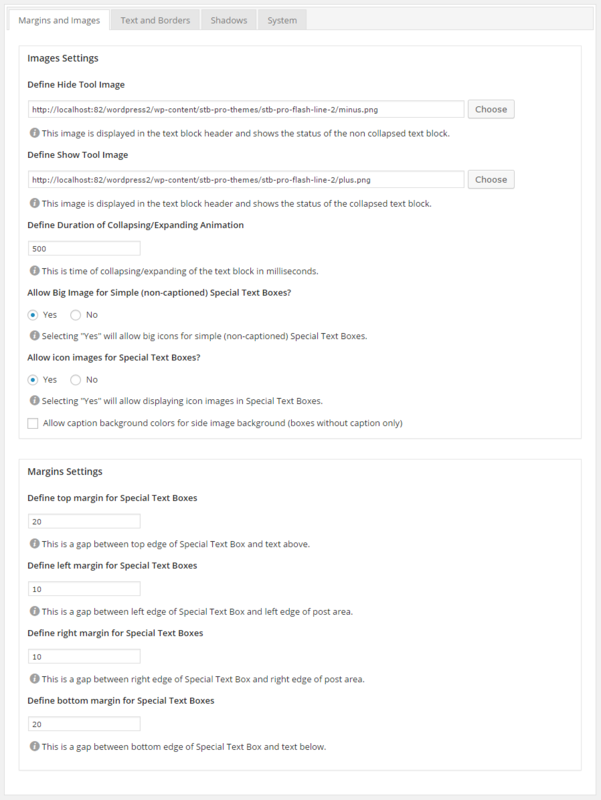 The different theme templates of WordPress are using different values of parameter box-sizing (usually content-box or border-box). In order to the STB block does not overlap the text of paragraphs above and below, set up top and bottom margins of STB blocks. Warning! 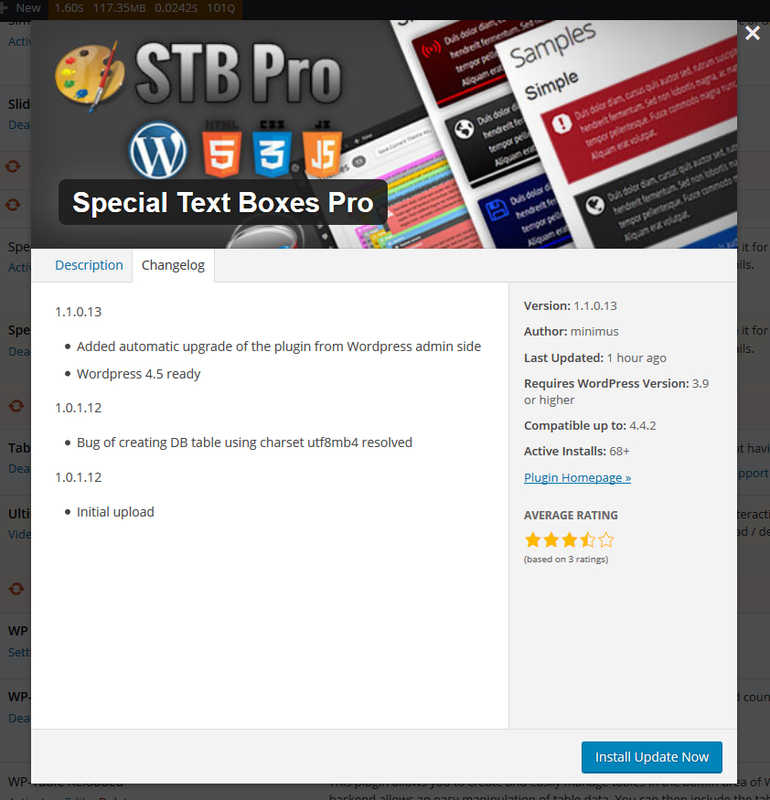 If you change STB theme, all settings of STB will be set to default values. Do not forget to set the values of the STB box margins to your preferred values. Using the parameters of block’s borders, you can configure the borders for all blocks, regardless of the block’s style. There are settings of line styles and corners of the block. The width of the border can be set in the Style Editor, for each style separately. Why? I don’t know! It’s historical legacy. Font Size, Font Family – Here you can set the font size and font family for the text of block and for its caption. Setting font size value to 0 forces use of the font size value declared by the current site template. In any case, do not use double quotation marks in the font family value fields! Use only single quotes! Web fonts – You can use web fonts that not defined by site template for text and caption of STB block. Each font defined by you will be loaded on each page of your site. You must define only URL of web font. One URL per row. Do not forget to define proper font family for web font(s). Language Direction – In theory plugin determines the direction of the text using the value of the corresponding parameter of the loaded document. Check it in practice was not possible. However, you can force the required value of text direction. Collapsing/expanding text box – You can set possibility of collapsing/expanding of STB blocks. This possibility will be expanded to all STB blocks. If you want set/unset this possibility for individual STB block, use attributes of STB short codes. Collapsed on Load – If you want all blocks with captions will be loaded in collapsed mode set this property to true (checked checkbox). This property will be expanded to all STB blocks. If you want set/unset this possibility for individual STB block, use attributes of STB shortcodes. 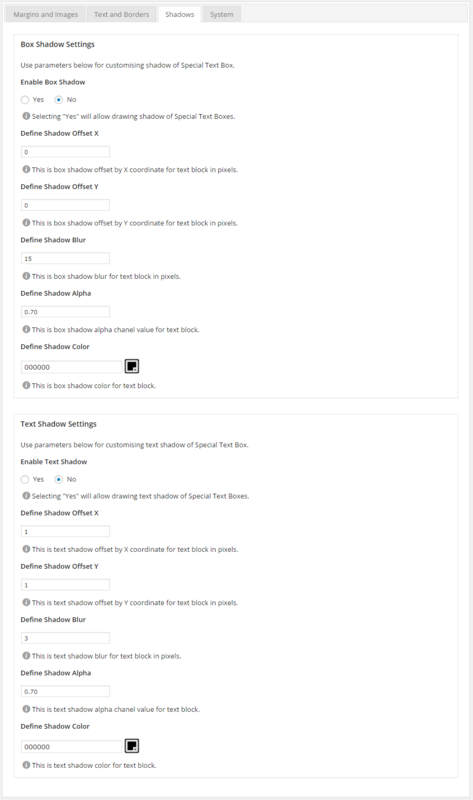 Here you can set the parameters of shadow for the STB block and for the block’s text. Enable Shadow – enabling drawing shadow for STB block/text. Shadow Offset X, Y – The position of the horizontal/vertical shadow. Negative values are allowed. Shadow Blur – The blur distance. Shadow Alpha – The opacity of shadow. Allowed float values between 0 and 1. Shadow Color – Select suitable color using color picker. These are system settings of plugin. Static mode means that will be loaded static style sheet file. This mode is more faster but needs full read/write access to CSS file. If you have full control over your blog, this mode is highly recommended. Dynamic mode – will be loaded dynamic (PHP) style sheet file. This mode is recommended for an inexpensive hosting with unpredictable rights of recording files. 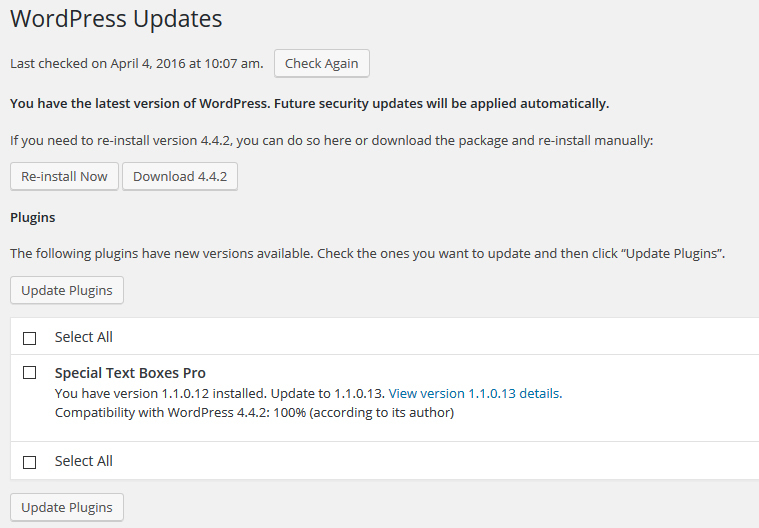 Starting from plugin version 1.1.0.13 you can update plugin using WordPress updating system. It means that all next versions of the plugin can be updated from Updates page or Plugins page of your blog. By security reasons you should update the plugin using Oauth authentication. For update plugin just click “Update Now” on the Plugins page or “Update Plugins” on Updates page. 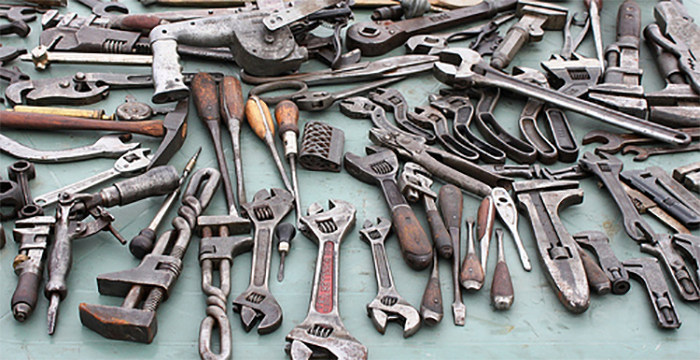 Use these settings to “clean” reinstallation of the plugin or for its complete uninstallation. 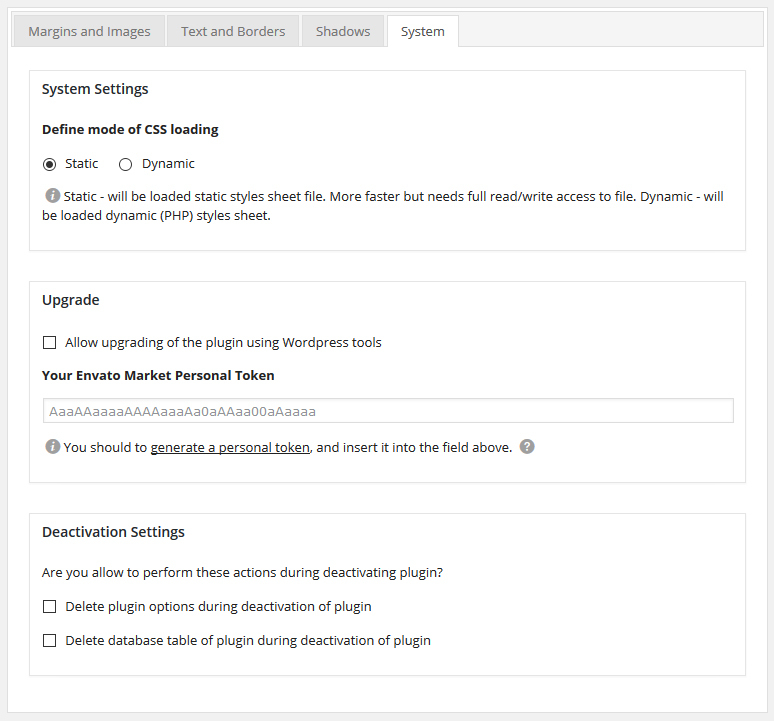 Delete plugin options during deactivation of plugin – During deactivation of plugin all the records in the WordPress database table, containing the parameters of the plugin will be deleted. Delete database table of plugin during deactivation of plugin – database table containing plugin’s styles will be deleted during deactivation of plugin.